Greetings from Yakima, Washington! 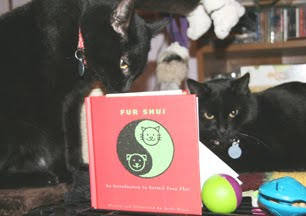 "Fur Shui" has been read by Lady and Salem. These fur folks certainly found their loving home and enjoy such great love chi from their person Peggy. Happy Valentine's day to all and these two certainly know how to bring in the "year of the Tiger" in Yakima! families to take them for who they were and one was kept. The mum cat tried other homes though they didn't work out. She grew on her new slave owner who decided to keep her. She is the most loving cat ever and loves petting all day though she knows she will always have a home. Lady is her name. Her boy, Salem is a smart cat. Tall and lean can touch the top of the counters though never goes up there. He likes to play fetch and do tricks. I love them and they follow me where ever I go. I wouldn't give them up for the world. 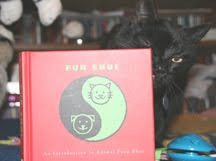 Salem wants to read the book and in the other photo, Lady is sending her love along with the book."